I recently needed to replace an aging Phenom II x4 machine. My eventual goal was a machine supporting 4x Nvidia cards for CUDA processing. Since the Gigabyte motherboard supports 4-way SLI, I felt assured I could support this need. (Yes, I know CUDA ignores SLI). I would have rather used an AMD 8150 to save money, but the cheaper motherboards translated to horrid 4x graphics card support and questionable quality. Needless to say I jumped on the x79 platform when Intel released a reasonably priced CPU for socket 2011. - Ubuntu 12.04 doesn't report the correct CPU MHZ. I GUARANTEE my 3820 was NOT running at 6GHz !!!! - Socket 2011/X79 platforms are great work station platforms. 40 lanes PCIE means far more graphics cards & SATA connections. This is much more than socket 1155/Z68/P67 platforms can provide. - Intel i7 3820 is not based off the same die as 3930k/3960k. Its more Sandybridge like with 2megs extra cache and lots of supporting silicon for the PCIE support. - Intel i7 3820 performs much like a 2700K and might not over clock as high because of all the extra silicon. TBD. Some have said 5GHz is easy for the 3820, I don't want the heat issues. - Intel i7 3820 has a max overclock multiplier of 43. It will do 4.3GHz easily on the stock voltage. Other tricks using BLCK are needed to go further. - Gigabyte x79 UD3 has a couple weak points. Only 4 DIM slots and possibly poorer over clocking based on the number of mosfets on board. - NAS results should have matched the 2500K. Perhaps the Hyperthreading was causing issues for the 3820? Regressions? - The 3820 trounced all chips in FFMPEG except for the 8150 (very close). At 4.5GHz, the 3820 kills all! Perhaps there is a regression for the 3960k here. Overall I'm very pleased. The Core i7 Extreme 3960X comes in at $1000 USD, whereas the Core i7 3820 can be found for $320 USD. The 3960X is not 3x the processor, in fact the 3820 meets and exceeds the 3960X in many tests! I am not delusional though. I certainly would rather have the extra 2 cores and easier over clocking of the 3960X. Perhaps one day when I'm rich off of a website! For anyone interested in the Corsair H100 cooler, its noisy pump and how to fix it, go here: http://forum.corsair.com/forums/showthread.php?t=97733 I recommend it. My machine was very quiet during all tests. It'd be nice to outline the fix, which seems to be downvolting the power to the pump. I built a 3930k system last november for demo purposes with an h80 cooler. I was pretty disappointed in how the installed radiator blocks access to the 2x4 power pins and the ram. And the board I got also only had retention clips for *one* side of the ram which resulted in me having to reseat the ram when I travelled with it. Benchmarking on our HPC application showed it to be noticeably faster (~50%) than the dual e5520 xeons we use for development. 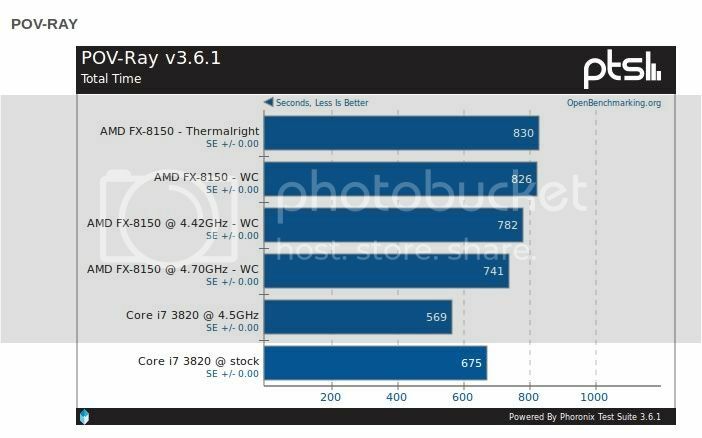 I'm curious about the bulldozer but our software is very double precision heavy and it seems amd abandoned FP speed with this new architecture. AMD squeezed out as much performance as they could on the old DEC Alpha derivative cores. There was no more low hanging fruit. I agree their FP performance has regressed, but their money makers are server and integrated CPU/APU units. Who cares about the small percentage of the population that need screaming single core speeds. I bet their next iterations will have even more cores and better FP performance. But, I'm getting way OT here. The 8150 would have been good enough, but I feel I have a far more reliable system as the AMD motherboards are just crap when supporting large numbers of graphics cards. I don't think I got raped on my build. I benched against the set of overclocked 8150's. I finally found the openbenchmark link to do so. The only really interesting result was POV Ray. 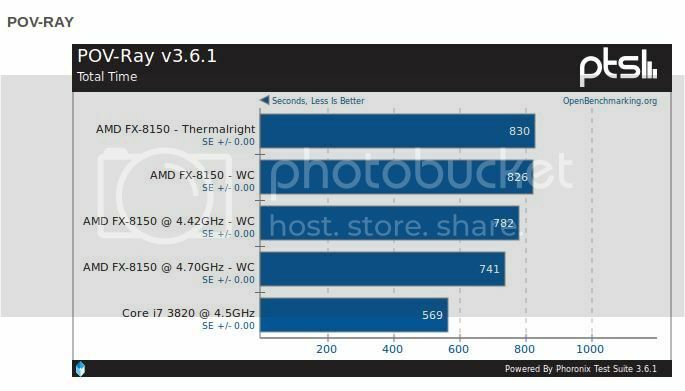 Pretty useful benchmark, except I wish it had the 3820 at stock speeds and not just overclocked. Historically I've never seen an overclocked machine be stable enough for production use. Though not a work machine, my home work station was over clocked for 3 years without issue. In the case of my 3280, I got 4.5GHz on stock voltage, though still I upped the voltage just in case. I'll post up a stock MHz povray comparison. Unless you missed it, my first round of test had both stock and over clocked values. Stock speed vs 8150 povray. Major *ish* update! I found that RAM interleaving options were hindering NAS Parallel benchmarks. I turned them off and got much better performance in some areas. Last update. Prime95 and other stress tests made me bump up the chip voltage to 1.32 volts. Everything is stable and never eclipses 50C. All done, time to just use the machine as it was intended!